According to news articles, Enzo Boschi, the head of INGV, stated that seismicity increased near Campi Flegrei Mar Sicilia a group of submarine volcanoes ~30 km S of Sicily, near Tunisia. Boschi stated, "The island could come back to the surface, but we'll have to wait and see... It could be a few weeks or months." The Stromboli On-Line website noted that similar statements have been made several times in the past couple of years. The increased seismicity does not necessarily signify that an eruption is imminent and the island will re-emerge above wave base. The Global Volcanism Program has no Bulletin Reports available for Campi Flegrei del Mar di Sicilia. Campi Flegrei del Mar di Sicilia (Phlegraean Fields of the Sicily Sea) is composed of a group of submarine volcanoes SW of Sicily. The volcanoes were constructed within a submarine depression about 1 km deep in the Strait of Sicily between the SW coast of Sicily and the NE tip of Tunisia, forming submarine banks that are capped by cones that rise to near sea level. 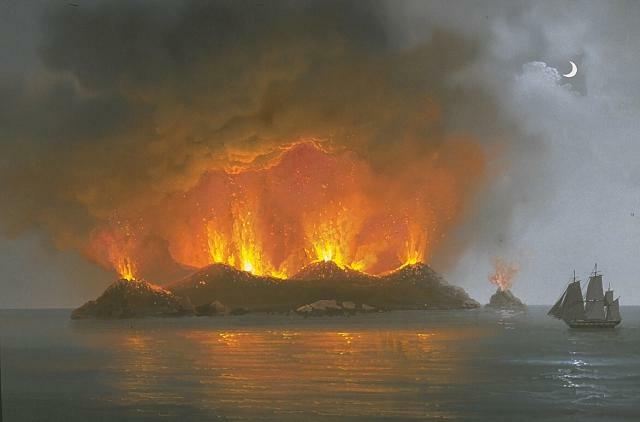 Submarine eruptions were reported at the Giulia-Ferdinandeo and Pinne banks during the first Punic war (264-241 BCE), and from the 17th to 20th centuries, sometimes producing ephemeral islands. The 1831 eruption at Ferdinandea (also known as Graham in English or Giulia/Julia in French) produced an ephemeral island that was promptly claimed by the navies of France, Britain, Spain, and Italy. Francis P W, 1995. Fire and water. Geol Today, 11: 27-31. Imbo G, 1965. Italy. Catalog of Active Volcanoes of the World and Solfatara Fields, Rome: IAVCEI, 18: 1-72. Washington H S, 1909. 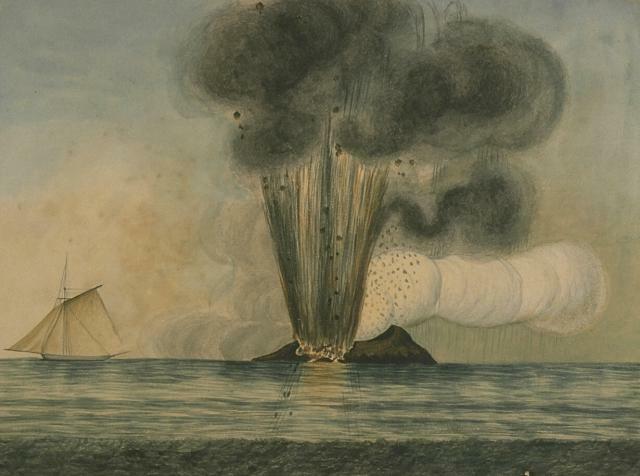 The submarine eruptions of 1831 and 1891 near Pantelleria. Amer J Sci, 27: 130-150. There is no Deformation History data available for Campi Flegrei del Mar di Sicilia. There is no Emissions History data available for Campi Flegrei del Mar di Sicilia. An eruption column rises above Graham Island (Giulia Ferdinandeo) in the Sicilian Sea in 1831. A new island was formed that was promptly claimed by Italy, France, Britain, and Spain. All territorial claims came to naught when the island quickly eroded to beneath the sea surface after the eruption ended. Graham Island (also known as Ferdinandeo Bank) is part of the Campi Flegrei del Mar di Sicilia (Phlegraean Fields of the Sicily Sea), a group of submarine volcanoes constructed within a depression about 1000 m deep SW of Sicily. From the collection of Maurice and Katia Krafft (published in Simkin and Siebert, 1994). This dramatic painting of a nighttime view of the eruption of Graham Island (Giulia Ferdinandeo) on July 13, 1831 shows late-stage strombolian eruptions originating from several vents along a fissure. A submarine eruption that began sometime after June 28, when earthquakes were first reported, eventually constructed a new island that reached a height of 65 m and a diameter of about 1/2 km. After August, when the eruption ended, the ephemeral island soon eroded beneath the sea. There are no samples for Campi Flegrei del Mar di Sicilia in the Smithsonian's NMNH Department of Mineral Sciences Rock and Ore collection. Large Eruptions of Campi Flegrei del Mar di Sicilia Information about large Quaternary eruptions (VEI >= 4) is cataloged in the Large Magnitude Explosive Volcanic Eruptions (LaMEVE) database of the Volcano Global Risk Identification and Analysis Project (VOGRIPA).